The Formatt 58mm 80C Color Conversion Filter is blue. It is used to balance daylight film under artificial, tungsten or standard (household) incandescent lighting. What happens when you want to take a photo of your grandmother in her apartment and she's sitting next to an antique table illuminated by an old antique lamp? You'd like to capture the essence of her age but don't want to make her look too pasty. Your daylight film with an 80C filter will leave just enough yellow in the image to give grandma a flattering warmth. This filter allows you to somewhat "balance", i.e. bring back, correct color tone to your images. There is some loss of film speed that may require the use of a tripod but, at least, your photos will demonstrate the proper tonality they so richly deserve. This process is revolutionary compared with conventional filter dying techniques by eliminating the need to directly coat the glass surface itself. The repeatable performance gained through A.C.T. 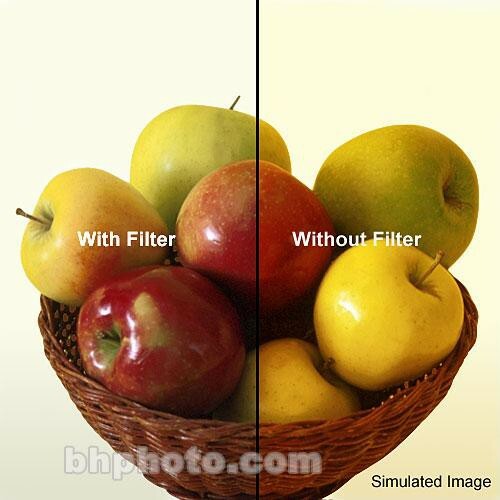 ensures that at any time you have to swap like filters for like filters in mid shoot, you can do so with confidence with no discernible differences in color or density.